My name is Eva Labrujere. I am a graduate of the Urbanism master degree at Delft University of Technology. 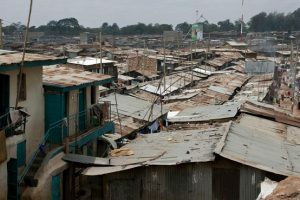 My graduation thesis (a research-and-design project) addressed sustainable development in the informal settlement of Mathare Valley, in Nairobi, Kenya. 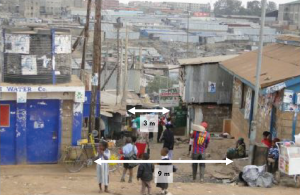 Its outcome included an academic research and a spatial plan that offered a possible, feasible vision for the spatial development of the Mathare community, developed with stakeholders on the ground. 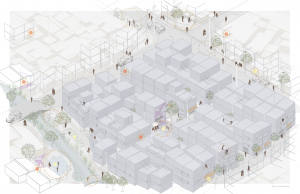 The proposed strategic framework takes into account the particular local urbanism, the informal institutions and traditional (and sometimes considered illegal) practices. 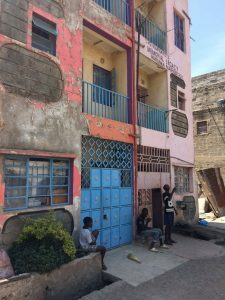 This project explores how local knowledge and a community-based approach can provide a base for a strategic framework to guide sustainable development in Mathare Valley (Nairobi, Kenya). The developed integrative strategic framework aims to build towards overcoming socio-spatial exclusion by triggering the self-strengthening capacities of residents and to co-operatively build up and manage different types of resources crucial to local development. As it would be too much to describe the developed framework in its totality, in this blog I will focus on residents’ deprivation of access to one particular resource: land. 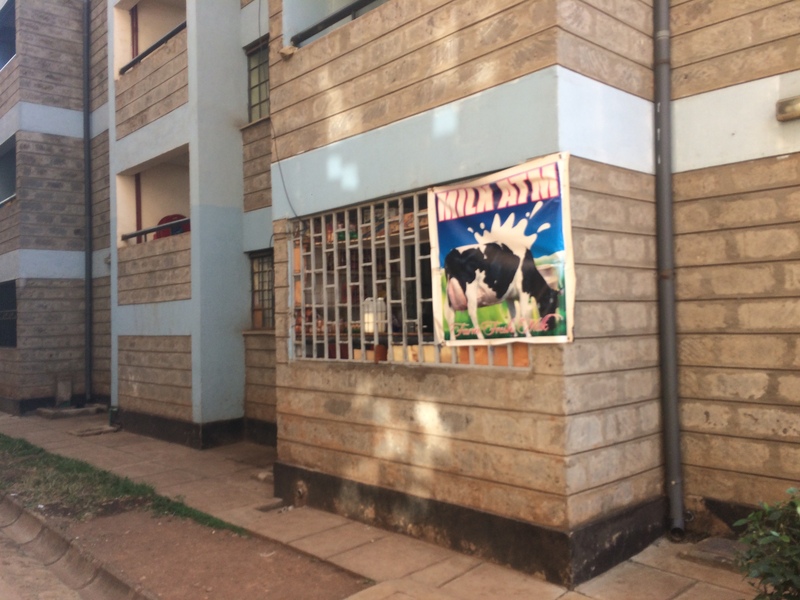 By recognising the potential of collective forms of land ownership and community-led housing development approaches, I am asking the question: What role could a Community Land Trust play for community-based sustainable development in the case of Mathare Valley? 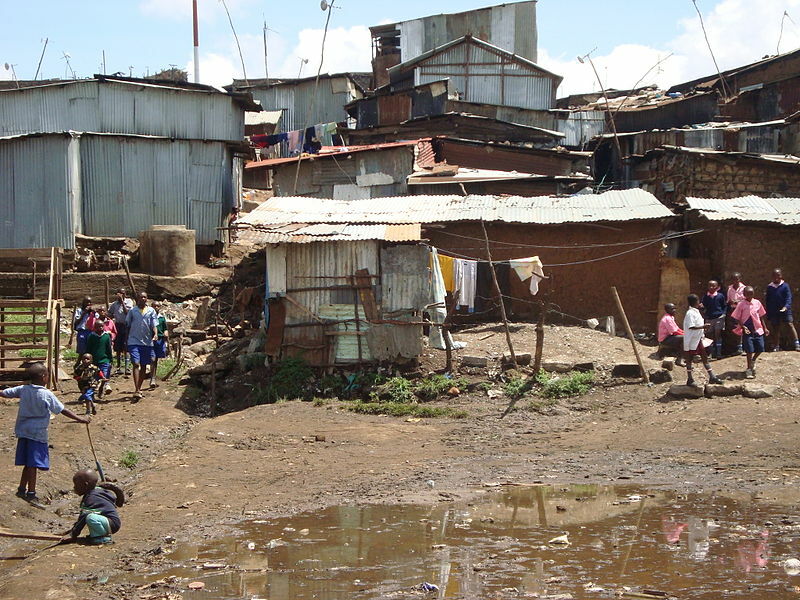 Nairobi’s long history of conflict and struggles for land (public land grabbing, corruption, illegal land transactions and lack of land management and administration), has impacted the formation of many of its informal areas, including Mathare Valley. Here, irregular land subdivisions and allocations have led to various conflicts in the settlement, fragmented ownership of land, and a lack of security of tenure. The type of land ownership differs for each of the thirteen villages that constitute the area, with the majority being privately owned land, and some publicly owned. Only a few of Mathare Valley’s residents actually have property rights. The majority (83%) are tenants (MuST and SDI, 2012), often renting their homes from ‘absentee owners’. This results in a victimised position, as they become subject to local predatory crime and bureaucracy. Lack of tenure security prevents any form of ownership and saving opportunities and residents live with the continuous threat of possible eviction and/or demolition of their houses. The continuously increasing demand for housing and the high profitability of possessing land and/or structures contribute to extremely high structure densities in the area. Space becomes contested due to overpopulation and specific social dynamics of the area: the research showed that certain spaces and infrastructural objects functioned as premises tied to the internal power distributions. This can provoke territorial behaviour of groups or individuals towards these premises. A CLT is a progressive mechanism that deals with the finite nature of land use and competing land rights in slums and offers ways to practice local tenure administration and management through communal land ownership. Also, a CLT can take up activities to coordinate community-led design processes: housing design and construction, community improvement projects, as well as community financing schemes. A CLT is an institution specifically created to acquire and hold land in trust for a given group (Bailey, 2010). It is based on the holding of two constituent parts: land, and the improvements upon it (Midheme, 2012). Individuals, the dwellers, in this case, own improvements, but lease the underlying land. 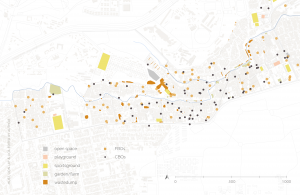 So, the CLT subleases the land to the residents through residential licenses. The land is held jointly by all homeowners via the registered trust and is equally divided into plots for incremental housing construction. 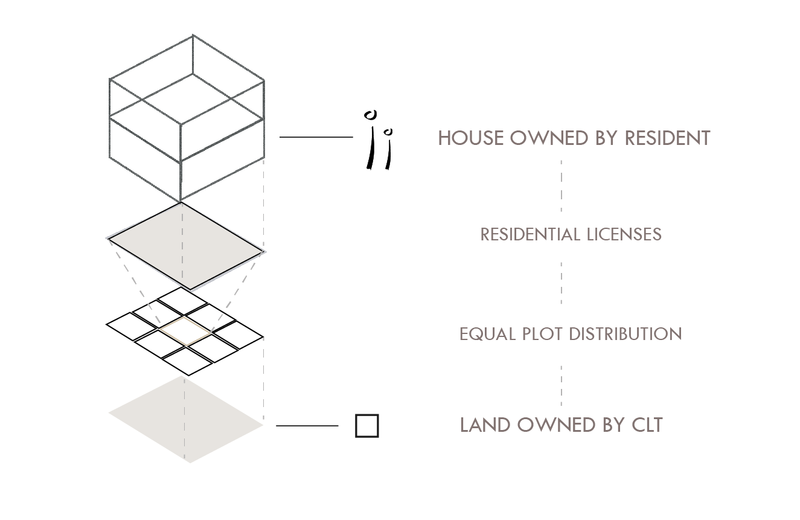 CLTs are formed to hold property in perpetuity and it separates land from its productive use so that the impact of land-value appreciation is ‘locked’ into the community (BSHF, 2005). This means it can enable affordability of housing in perpetuity and thus sustainable local development. Long-term security is also important in shaping voluntary resource mobilisation from communities and commitment from other stakeholders (University of California et al., 2014). 2) localise decision-making process (coordinating the process of needs identification, to definition of the intervention, to implementation of that intervention). Under the right support (temporary, until self-sustaining), the community is able to do this inclusively and democratically. 3) build collective resources and manage these. Through collective ownership over resources as land, knowledge, and finance, accessibility to these is increased and the community becomes less dependent and vulnerable to factors of exclusion and exploitation. These provisions are underscored by the position that “The foundation of almost any solution to the problems of the urban poor lies in their potential to organize themselves, to make effective decisions, and to negotiate and collaborate with local government and other partners.” (UN Millennium Project, 2005, p.28). Furthermore, building towards ownership at the individual level has shown to be essential. The envisioning of a possible future that includes ownership over a house with an actual house number is a huge change in perspective for the residents. It allows for long term aspirations and creates incentive to believe and engage in participative activities (B. Ochieng, personal communication, Feb 5, 2018). It is the meaningful manifestation of the – long-time considered impossible – acquirement of their rights as citizens. I would like to give two examples of my strategic framework on how providing ownership in local development through a CLT is instrumental for more contextualised and in-situ, hence sustainable solutions. 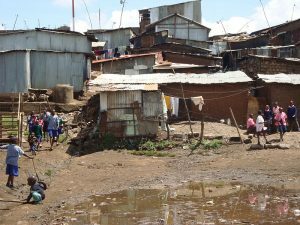 Within participatory slum development, it is increasingly acknowledged how informal governance and power relations are essential practicalities in developing and managing participative projects and sustainable change. This is underscored by the research’s finding of the aforementioned spatial premises, as well as the notion that the structure of the local governance (especially the central administration through the chief-chair(wo)men cluster) derived from the actual spatial layout based on the subdivision into villages – this cluster forms the authority when it comes to resolving (spatial) contest on the ground, hence has a practically essential role in any spatial intervention and decision making process . The concept of a local institution for development presents the possibility of adaptation to the existing informal governance structures of the area. In other words, informal governance can help to determine the evolvement of such an institution. In my research proposal, this concept of a CLT was translated so as to act as the connecting element between ‘informal’ and ‘formal’ planning levels. The ultimate outcome of such measure is articulated in the diagram below. and of the requirements of spatial interventions is preserved. 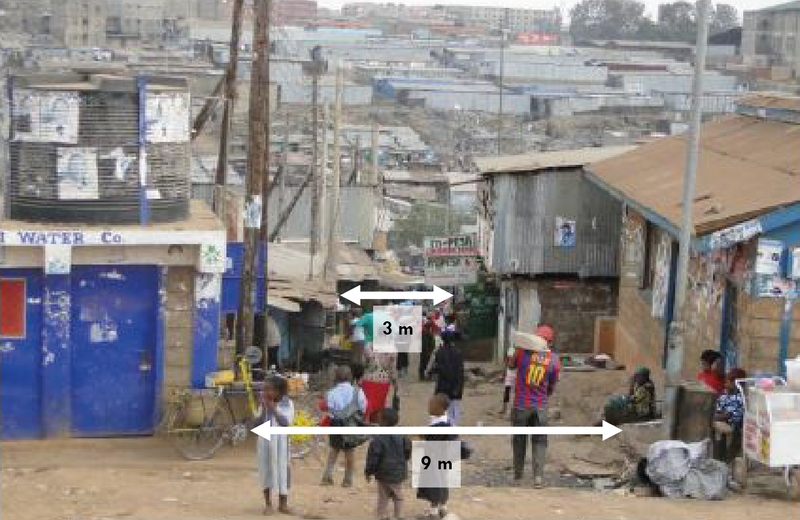 Contrary to state-led intervention as the standard in slum-upgrading programs, fuelled by prevailing modern Western urban imaginaries, a community-led process would maintain the existing symbiotic relationship between housing characteristics and the local social and economic networks and patterns, such as social ties connected to collectively shared inner courts in Mathare Valley, and livelihood strategies that are enacted with housing, as in found in most cities of the Global South. Such a process leads to more sustainable solutions because it drives attachment and belonging, while mainstream upgrading practices show housing typologies which appear incompatible in accommodating the way of life practised locally. Innovative concepts are needed to change current exclusive systems of land tenure and land governance in Kenya, and cities in the Global South in general, that deprive the urban poor of the right to access land and adequate housing. 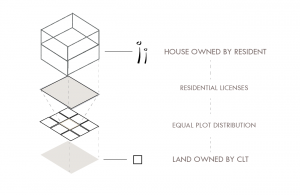 A CLT offers a way to practice land tenure regularisation on a small scale. It can be central to a community’s capacity building in order for the urban poor to acquire communal ownership of land on which they very often have been settled for many years. It holds the potential to bridge institutional regulations and the ‘rules on the ground’, thus accommodating inclusive decision-making, and hence fostering sustainable development based on peoples’ actual needs and local circumstances. Bailey, N. (2010). Building Sustainable Communities from the Grassroots: How Community Land Trusts can create Social Sustainability. In Manzi, T., Lucas, K., Lloyd-Jones, T., and Allen, J., (Eds. ), Social Sustainability in Urban Areas: Communities, Connectivity and the Urban Fabric. Pp.49-64. London: Earthscan. Midheme, E. (2012). 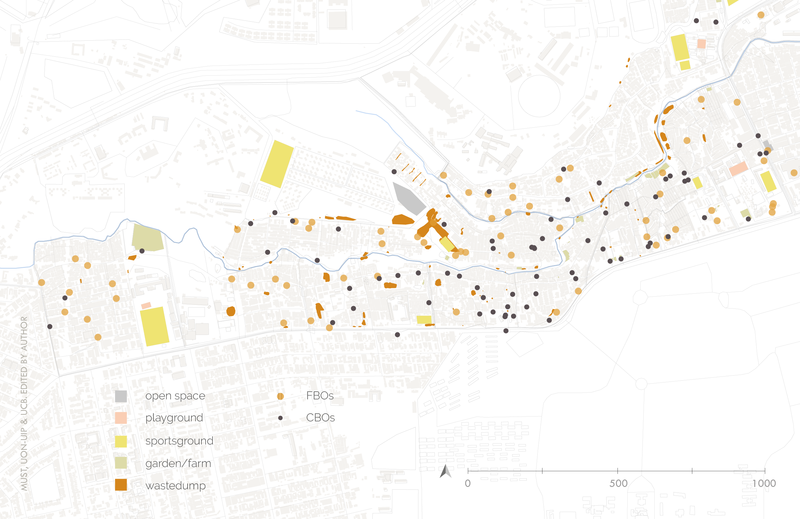 (Re)designing land tenure to meet housing needs of the urban poor. 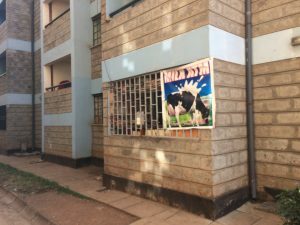 Implementing community land trusts in Kenya. Planum – The Journal of Urbanism, no.26, vol.1/2013. ISSN 1723-0993. Building and Social Housing Foundation (BSHF). (2005). Redefining The Commons: Locking in value through community land trusts. The University of California, Berkeley, Department of City & Regional Planning, Akiba Mashinani Trust, Muungano wa Wanavijiji, University of Nairobi, Department of Urban & Regional Planning, Shack/Slum Dwellers International (SDI) and Strathmore University. (2014). 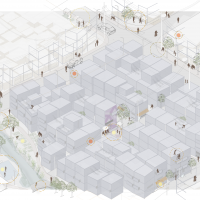 Mukuru Studio – Inclusive upgrading frameworks for Nairobi. United Nations Millennium Development Task Force. (2005). UN Millennium Development Library: A Home in The City – Achieving the Millennium Development Goals – Improving the lives of Slum Dwellers. Routledge. Any comments or questions, please contact me at info@evalabrujere.nl or write to landac.geo@uu.nl.